Once you cross that line, there’ll be no memories. Do you like a decent ghost story? And does the subject of a traumatizing experience that affects the human psyche of an individual, stimulate your curiosity? I guess “Marrowbone” is a suitable film for you. Don’t let the label horror scare you, because it certainly isn’t a horror. For me, there was only one moment that startled me a bit. The rest of the film is a successful portrait of emotional pain, the processing of the loss of loved ones and a heavy past full of abuse and shame. And this immense suffering is softened by a young fledgling love. In the end, you are wondering which ghost is haunting Jack and makes his life miserable. I’m not going to elaborate any further on this film, as I’m sure I will give away the final denouement in one way or another. No, I suggest you give this film a chance and decide for yourself whether or not it’s successful. What this film truly excels in is the way in which important facts are gradually revealed. It all remains mysterious until the end. And more than once you are guessing what’s really going on. But if you watch horrors on a regular base and you have seen some similar movies, you will soon figure it out. Perhaps for some, the pace will be a bit too slow. I, on the other hand, think that such a peaceful build up is magnificent. What also stood out was the beautiful framing of the film itself. This dilapidated house in which the family has withdrawn itself, after the revelations of the terrible and horrific deeds of their father, is beautifully portrayed. An old, abandoned house full of dark, dusty places and ominous, scary sounds. A real haunted house, as it were. Not as beautiful and majestic as the imposing house in “Crimson Peak“, but it feels the same. The outdoor shots also look beautiful and idyllic. The renditions are admirable. First of all, the acting of Matthew Stagg may be called impressive (even if it’s limited to portraying childish wondering and fear). George “How I live now” MacKay shows in a convincing way how he, as the eldest, takes responsibility and at the same time we see the suffering of a tormented and haunted soul. Until the moment he’s together with Allie (Anya Taylor-Joy), the modest, lovely girl next door, who has been charmed by this youthful head of the family from the start. Anya Taylor-Joy is all mysticism and mystery. Those big staring eyes would also confuse me. And apparently, this actress loves films (such as “Split“, “Morgan” and to a lesser extent “The VVitch“) where the suspense is killing you. 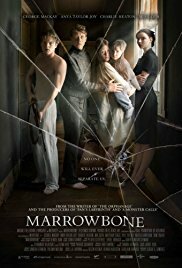 Let’s say “Marrowbone” is ominous. You can’t really call this film simplistic. Every time you think you know what it’s all about, there’s another twist and everything seems different again. This in combination with the slow build-up may well be too much for some. And those who saw the trailer, also had different expectations I guess. However, I found it a fascinating film with some exciting moments (I was hoping for a sort of movie like “Oculus” after seeing those covered mirrors) and immersed in a creepy atmosphere. It certainly isn’t a groundbreaking film, but still worth a look.